Canada's plastic money is stumping counterfeiters. 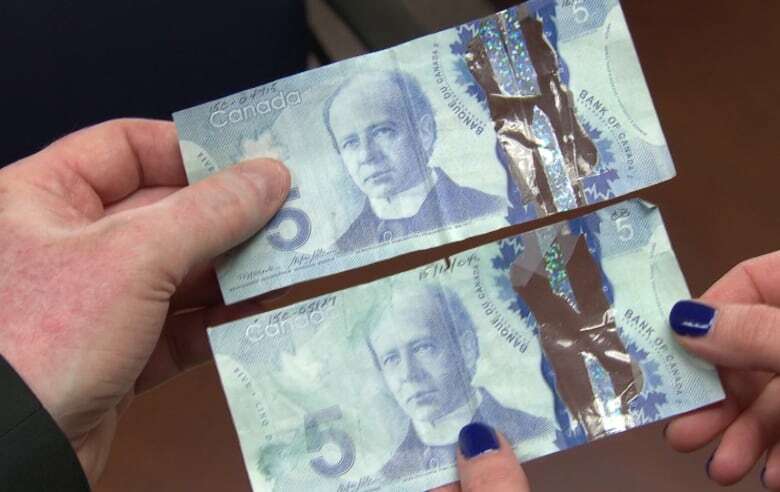 The RCMP estimate the number of fake bills passed in 2015 dropped by 74 per cent. 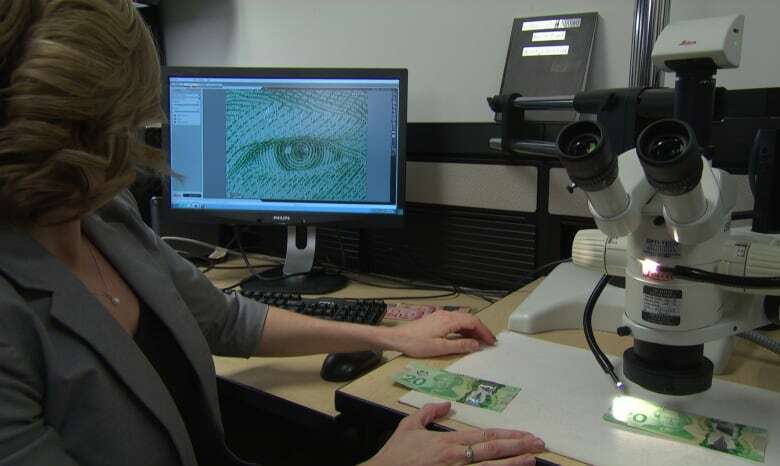 As CBC News learned on an exclusive tour of the force's National Anti-Counterfeiting Bureau, even the best attempts to make fakes are falling short. The bills in Wolfe's case, like all bills turned over to police across Canada, eventually end up at the RCMP's National Anti-Counterfeiting Bureau in Ottawa. 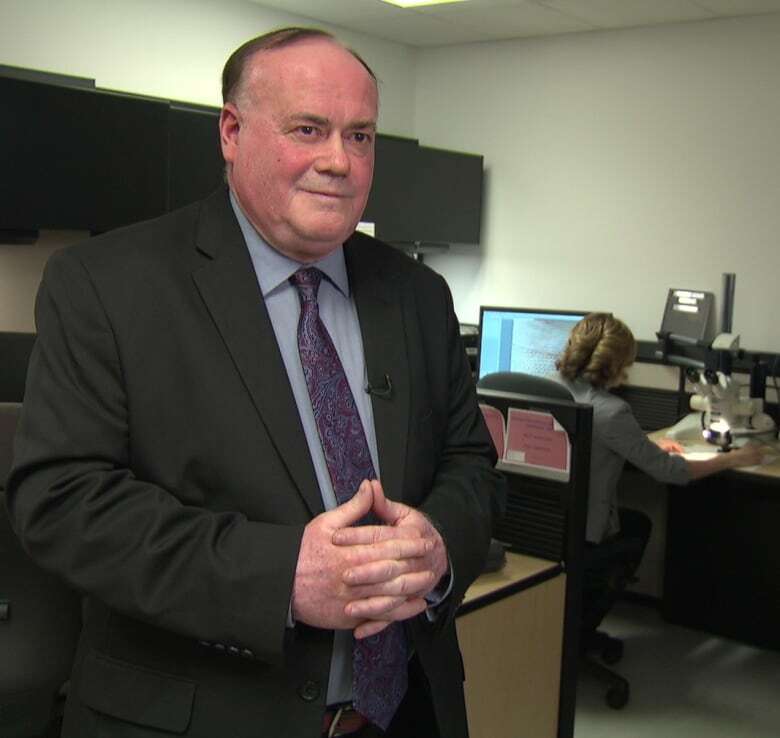 CBC News was granted exclusive access to the facility that examines counterfeit money, credit cards and official documents such as passports and driver's licences. "Generally we're seeing a poor to medium-quality counterfeit note," said Robert Moyes, examiner of counterfeit for the RCMP. About 10 years ago, when counterfeiting was at its height in Canada, Moyes said, his lab would receive up to 45,000 notes every month. In December, Moyes said, the lab received 1,500 bills and many were copies of older-series paper notes, which are easier to fake. "It's more of a challenge to the counterfeiter to produce these [new banknotes] and the simulation of the security features has been very poor," said Moyes. Most of the counterfeit polymer bills are printed on paper. Some used paper with a waxy or plastic coating. A few bills look passable from a distance, but up close are too shiny and slippery. One $50 bill OK at first glance — but the other side is completely blank. "You only need to pass it once and the cashier is not going to turn [the bill] over," said Moyes. Several $5 bills at the bureau feature strips of glittery wrapping paper taped to transparent plastic strips in a crude attempt to simulate security holograms. Moyes said others go a step further by buying holographic sheets from shops in China. Shipments of the holographic sheets have even been seized by the Canada Border Services Agency. "There's your average counterfeiter, who is short of money and they may produce 10 or 20 notes. We have organized crime, we have the biker gangs. Those tend to be the large contributors to our office." All of the bills received by the bureau are examined by specialists under microscopes and different sources of light. 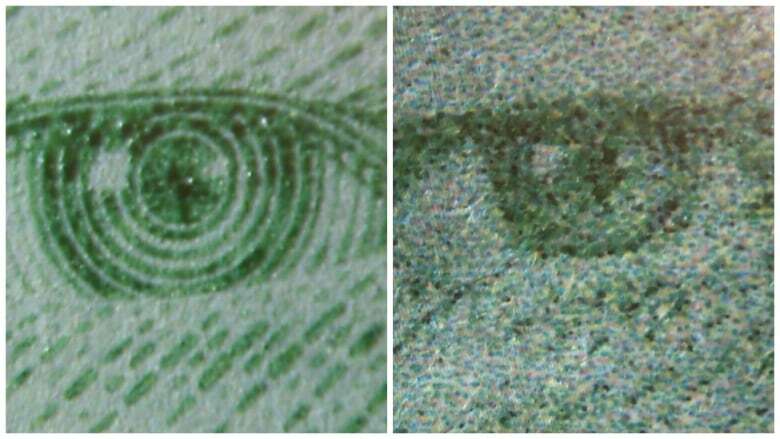 When a technician puts a genuine $50 bill under a high-powered microscope, the image of an eyeball comes up on a large computer screen. It's easy to see several security features, including the fine detail of raised red ink from an engraved plate. Even though that feature can only be seen under a microscope, it's something you can feel under your fingertips or by running a fingernail across the bill. "It's got life to it. There's a tactility," Moyes said, adding that just the "feel" of a bill is one of the best ways a regular person can detect a fake. When the genuine $50 bill is replaced under the microscope with a fake, it appears muddy on the screen. "This is the eyeball — you can see the lack of line work, resolution. And in some cases, if it's toner, it flakes right off," Moyes points out. Other bills are examined under three different sources of light. In the case of one $100 bill, a copy of an older-series paper note, the counterfeiter has done a respectable job adding ultraviolet features. Some retailers use UV boxes to test bills. Moyes said this bill likely would have passed such a test, which is why the RCMP and Bank of Canada recommend looking for more than one of the security features on higher-value bills. Passing paper bills is just going to get harder as they disappear from circulation. The Bank of Canada estimates 80 per cent of notes in circulation are polymer. The disappearance of Canada's paper notes will likely force fakers to try to improve their efforts at counterfeiting polymer. "They'll always be doing that. Nothing is counterfeit-proof," said Moyes. "Everything can be simulated." 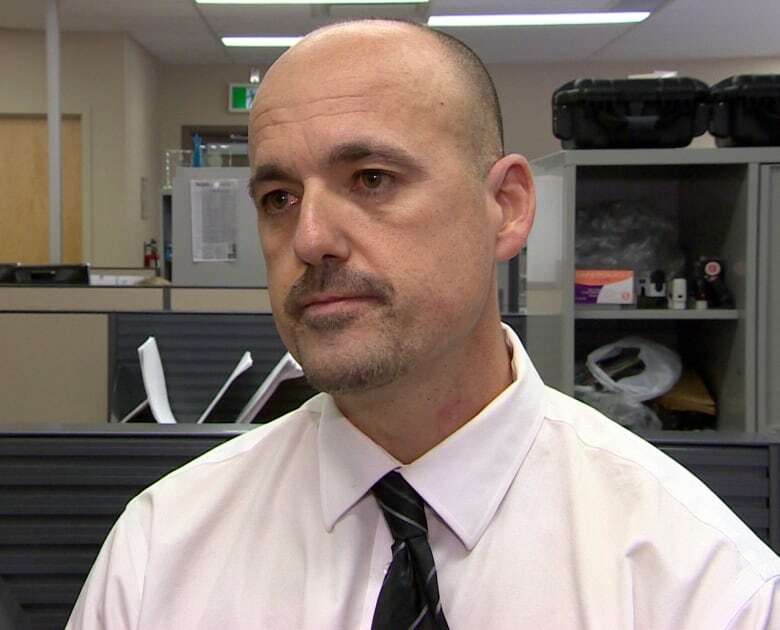 According to Moyes, more sophisticated polymer counterfeits are surfacing in Australia, where polymer bills are produced, and Mexico, where they are processed. That's why the bureau is conducting its own research to keep ahead of trends. In one room, staff experiment with 3D printers to see how criminals could possibly use the machines. "It takes a while for the counterfeiter to experiment. And we are seeing the experiments. The Bank of Canada is aware of that and the Bank of Canada is currently looking at the next series," he said. The $100 bill is the most commonly counterfeited Canadian polymer banknote. For older series paper money, the $20 bill is most often counterfeited. Bank of Canada estimates that 80% of banknotes circulating today in Canada are polymer bills. When the Loonie sinks in value, the RCMP sees more counterfeit U.S. currency in Canada. U.S. bills are easier to copy and Canadians are not as familiar with the security features. $50 US is worth more than $70 Canadian right now. Rash of fake polymer bills in B.C.